High-performance motherboard (ATX) with AMD x370 chipset, 2x PCIe 3.0 x16 & 1x PCIe 2.0 x16 (x4), 2x M.2 & 6x SATA 6G, 2x USB 3.1 / 8× USB 3.0 / 6x USB 2.0, integrated RGB-LED lighting Motherboards with the AM4 socket serve as the platform for the AMD Ryzen (Summit Ridge) quad-core, hexa-core and octa-core CPUs as well as "Bristol Ridge" and "Raven Ridge" desktop APUs from the A-series with integrated GPUs unlike the old Athlon X4 which came without an iGPU. The advanced AMX X370, B350 and A320 chipsets are aimed at the enthusiast, mainstream and entry-level segments coming with an abundance of modern I/O interfaces and connectors for hardware peripherals, while additional data links are provided by the GPU/APU. The MSI X370 Gaming Pro Carbon is an ATX motherboard and comes with a lightning-fast PCI-Express 3.0 slot, which comes with a full 16 lanes. Furthermore there is a PCIe 3.0 slot with a 8x interface, a PCI 2.0 slot with x4 lanes as well as three PCIe 2.0 x1 slots for other expansion cards. Up to 64 GB DDR4-RAM can be installed into the four RAM slots, which in turn operate at a maximum of 2.666 Megahertz. range of internal connectors includes, among other things, two USB 3.0 headers and two USB 2.0 headers for a total of four ports respectively. Data storage devices such as SSDs and hard drives are managed via six SATA 6G connectors (incl. RAID support) as well as two horizontal M.2 slots, which are connected via 4 PCI-Express 3.0 lanes respectively and therefore provide huge speeds of up to 32 Gbit/s. M.2-SSDs measuring from 42 mm to 110 mm in length can be used and furthermore the cutting-edge NVM-Express protocol is also supported. This protocol has been optimised to take advantage of the parallel processing utilised by modern PCIe SSDs. 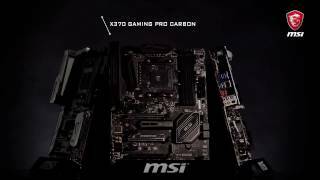 A further highlight of the MSI X370 Gaming Pro Carbon is to be found on the reverse of the motherboard, specifically the fact that the motherboard includes a USB 3.1 Type C connector and a USB 3.1 Type C connector. This new kind of USB Type C port is particularly thing and can finally be inserted in either direction. USB 3.1 or USB 3.1 Gen 2 can reach a maximum transfer rate of up to 10 Gbit/s per port. A special feature of the board is the integrated MSI "Mystic Light" RGB-LED lighting, which enables lighting on the VRM- as well as chipset cooler and on the PCB itself, including coloured lighting in all colours that can be controlled via app. Other refinements of the MSI X370 Gaming Pro Carbon include the "Audio Boost 3" functionality with Nahimic Sound Enhancer 2, the stabilising "Steel Armor" and the Click BIOS 5 for simplified fine-tuning of the system. Last but not least, five fans with 4-pin PWM connectors as well as a pump for water cooling can be connected directly to the board. On the reverse of the motherboard is located the I/O shield which provides access to further devices and components via USB 3.0 and 2.0, Gigabit LAN, universal PS/2 or five audio jacks for connecting 7.1 sound to the MSI X370 Gaming Pro Carbon. Furthermore the monitor outputs of the integrated APU-GPU (optional) include two monitor outputs: HDMI and DVI-D.
More links for "X370 Gaming Pro Carbon AMD X370 (Socket AM4) DDR4 ATX Motherboard"
So much better with recent BIOS/AGESA updates. Stable, booting faster and supporting Samsung B-Die (8Pack) @ 3333C14 with R7 @3.8. Decent option at this price.